Since taking over the reins as Vice-Chancellor of CQUniversity in 2009, I have been focused on working with others to make the University a great university. 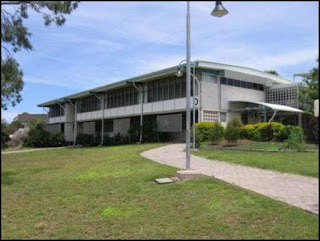 In August 2009 CQUniversity embarked on an ambitious Renewal Plan, which outlined possible ways for CQUniversity to become Australia’s most engaged university. The goals of this renewal plan included making the University financially sustainable, making CQUniversity a strong regional university and making CQUniversity one of Australia’s great universities by 2020. I’m pleased to say that after three years, this vision, which we refer to as ‘From Strong to Great’, is being realised, and 2012 has really set the foundations for a successful future. The past year has delivered CQUniversity with a number of highlights – some of which include the appointment of a Pro Vice-Chancellor and BMA Chair (Indigenous Engagement), the expansion of our Noosa campus and refurbishment of the Rockhampton Library and Engineering precinct, the establishment of a distance education study centre in Cairns, the opening of a state-of-the-art Health Clinic in Rockhampton and of course recognition of our staff through national teaching awards and competitive grants. 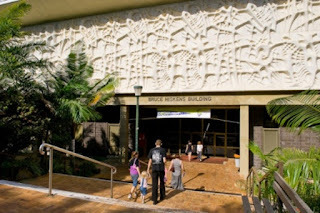 Of course the biggest highlight of 2012 would have to be the approval of the dual-sector merger between CQUniversity and Central Queensland Institute of TAFE, by the Queensland State Government. This is undoubtedly one of the most important events in CQUniversity’s history. Combined with CQUniversity’s focus on research outcomes, engagement, inclusiveness, student experience and quality distance education, I truly believe becoming a dual-sector university will make us one of Australia’s great universities by 2020 - we will be more diverse, better resourced and more adaptable to the changing needs of industries and employers than ever before. I am sure you will agree that the future of CQUniversity looks bright - it really is exciting to think of all the possibilities ahead. I hope everyone has a safe and happy Christmas with family and friends and I wish you all the very best for 2013. I know Anita and I are really looking forward to a break so we are refreshed and ready for the new year. Last Saturday morning there would have been thousands of nervous school leavers’ right across Queensland waiting to check what their OP scores were. For many this would be a daunting experience – a culmination of 12 years of schooling represented in one number. Sure it’s great to get a fantastic OP result, but if you didn’t it certainly isn’t the end of the world. You can still be what you want to be and I’m sure in 10 years’ time you will be doing what you want or at least on the path to discovering what it is you want to do. Regardless of your OP it’s important to remember there is always going to be more than one path to get to where you want to go. Good luck to all recent school leavers’! Embrace and enjoy all the challenges and opportunities that lie ahead. Congratulations to all the parents as well - you have also been very much a part of this exciting journey so far. There has been some great news coming out of CQUni lately and yesterday was no different. Below is a picture of some the CQUniversity Mo Merchants who recently grew their mo’s for a good cause. The team found out yesterday they officially topped the national Movember UniChallenge ladder raising $15,200 for various men’s health issues. 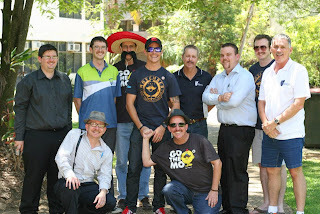 All up the 32 uni and TAFE teams making up the challenge raised close to $100k! Well done to all involved, especially our team captain David Murray who led the charge with a variety of fundraising activities. This is just another great example of CQUniversity being Australia’s most engaged university and a university that gives back. After three long years of intense negotiations with two state Governments, Central Queensland has finally got approval from the State Government, to break from the rest of the herd and adopt a new model of post-school education. 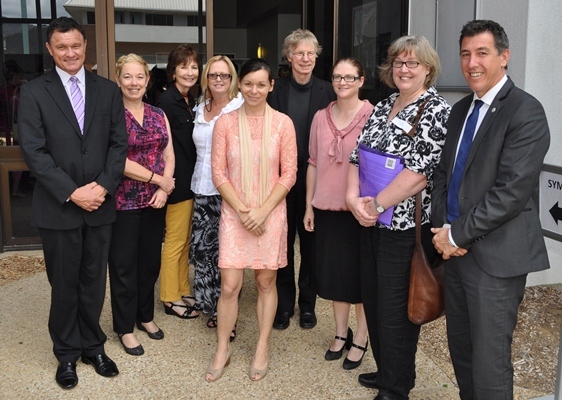 As of 1 January, 2014, CQUniversity will be operating a Queensland’s first dual sector university. 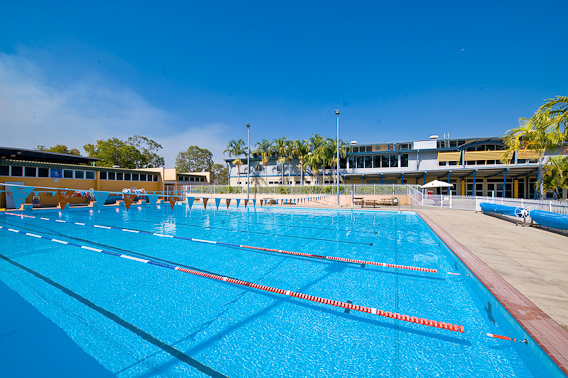 CQUniversity is one of the fastest growing universities in Australia and CQ TAFE the second largest TAFE in the State. Both of them are fantastically strong, vibrant institutions driven by remarkably talented staff. Both Institutions have had a long, proud history of strengthening our communities with generations of highly skilled graduates that are second to none. And now, finally, both institutions can merge together to create one of the most coordinated, holistic and innovative education and training providers in the country. People often ask myself and Gary Kinnon, the Director of CQ TAFE, why this region needs the university and the TAFE to merge. I’ve always felt, and I know Gary agrees, that Central Queensland is a region unlike any other in Australia, and we are at a time unlike any other, with opportunities and challenges being thrown at us that only come along once in a lifetime. The communities, industries, economies, workforce pressures, skills needs, environments and lifestyle options of Central Queensland cannot be found anywhere else in the state, yet for decades we’ve had the same cookie-cutter post-school education options as every other region. But not for much longer. The merger of CQUniversity and CQ TAFE will unlock the region’s potential to respond more quickly and effectively to the education and training demands in our own backyard. 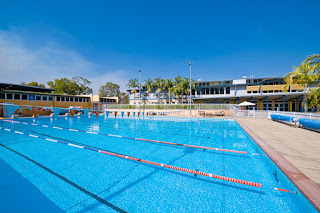 Currently we have a TAFE and a University, both full of great staff, both with fantastic facilities, both competing for the same school leavers and students, both trying to skill the local workforce, but with no real coordination or strategy between them because they are working in relative isolation. And it is the students that are missing out. I believe this idea of academic apartheid – where you are either on a ‘TAFE’ or ‘University’ path for life – has held this region back from realising its full potential. We are about to blur that line between TAFE and University to the point where our students don’t even realise they are drifting back and forth between the two. Our students will get to experience the best elements of each institution – from award-winning teachers to state-of-the-art facilities to real, tangible industry links – with the goal of producing the most highly skilled, well-rounded and employable graduates in the country. I’m talking about electrical engineers with practical TAFE competencies built into their degree; TAFE-trained enrolled nurses who don’t think twice about returning to their alma mater to train further to be a registered nurse; and sports science students with a personal trainer qualification built into the first year of their degree so they can work in the industry while they study, rather than at a pub or cafe. I want us to train the best welders, fitters, electricians, teachers, nurses and accountants that we possibly can. And I want this region to celebrate the graduation of a diesel mechanic at a ceremony alongside the graduation of a podiatrist, because Central Queensland is in desperate need of both. In conclusion I’d like to personally thank and highlight the hard work and dedication shown by DVC, Industry & Vocational Education, Nik Babovic and his team for getting us to this point. Along with Nik and his team, I look forward to working with all of you in 2013 as we make this exciting transition. Over forty years ago Michael Collins, Buzz Aldrin and Neil Armstrong went to the moon. They became famous and basked in the limelight of success. I think however that everybody now acknowledges that thousands of people contributed to that successful moon landing (conspiracy theorists aside). In fact it can be argued that the American people through their taxes contributed to the success. Today we have learnt that CQUniversity research efforts have been judged as outstanding by the Excellence in Research Assessment exercise carried out by the Australian Government. In two years since the last exercise our research output and quality have increased immensely. This time round we rated as having research that is well above world standard in two divisions and three sub divisions. We also had another sub divisional area that was at world standard –so without getting technical –let’s just say this is fantastic! We congratulate our ‘rock star’ researchers (our Collins’, Aldrin’s and Armstrong’s) for this result – we are all so proud of you. Equally I also want to congratulate everyone within the University who has made this remarkable achievement possible - the cleaners who cleaned up after research events, the finance people who sorted out the money issues, the grounds people and caterers who put up the signs and catered for research events, the People and Culture folks who helped with recruitment, the facilities staff who helped build the research facilities, the librarians who did the literature searching, the graduations staff who worked with the research students, the media and communications people who got the message out there, the marketing staff who recruited the students etc, etc. Then of course there are the people who were directly involved with supporting the researchers - their technical staff, the ITD people who provided the computer support and the folks in the research office that did all the paper work, administration and support. Then there are my senior colleagues – the Deans, Associate Deans, PVCs and DVCs. In particular we owe a great debt to Chad Hewitt and former DVC Academic & Research Jennelle Kyd. I also want to congratulate all our teaching staff – particularly those who decided to become teaching scholars. By doing this you contributed to this result as much as anyone. It is also important to recognise the engagement between CQUniversity and our Regional Engagement Committees who have all played a very important part in this success by showing us what needed to be researched. A special mention must also go to our fellow Regional University Network counterpart SCU who is now ranked 10 up from 25 in 2010 – this is outstanding - you are an example of how important regional universities are to our nation. In conclusion, CQUniversity has done a lot over the past 18 months in terms of research that did not contribute towards this result, so I am very confident (and excited) that in a few years’ time we will do even better as we move toward our goal of being a GREAT university. This is a wonderful early Christmas present. 2012 has been a remarkable year for CQUniversity and it was great to be able to celebrate all that has been achieved last Friday night. More than 300 staff and students, as well as members of the local community attended the CQUniversity Fire & Ice Christmas Ball held in Rockhampton. A good night was had by all. Below is a photo of the CQUniversity Executive Team taking part in the festivities. To see more photos from the evening click here. I’ve recently signed up to be a part of an exciting research project being conducted here at CQUniversity. The CQUniversity Walk 2.0 Research Project is being conducted with the objective of getting more adults active through walking and other moderate physical activities. The project team conducting this research will be exploring whether or not social networks help people become more active. Participants in the study will be split into three groups, with one using the 10,000 steps program whereby people log their daily steps on the 10,000 steps website, the other group will use an online platform similar to Facebook where they can connect with other participants, log their steps and comment on their progress; and the final group will use a handwritten logbook to record their activity. With more and more people now connecting online it will be interesting to see whether this trend can also have an impact on out physical activity levels. As we all seem to get busier and busier, with work, keeping a house and raising a family exercise and physical well being is often the first thing to get left behind. I’ve certainly been guilty of it. It’s never too late to turn things around though as keeping healthy and looking after ourselves is the most critical aspect in being able to meet our work and family commitments. Interestingly, what many people also don’t realise is that it only takes 30 minutes a day to meet the recommended minimum physical activity requirements for an adult. By meeting this requirement our overall wellbeing and health can be greatly improved. When you look at 30 minutes a day doesn’t seem like a lot of time to invest in our health, does it? So rather than wait to make a New Year’s resolution to get more active (which I never keep anyway), I’m excited to get involved in this project right now and see what results I can achieve in both the short and long term. What’s more I’m also excited to be able to work with some really great researchers here at CQUniversity on an innovative study that should help people get more active and healthy. If you live in the Rockhampton area and are interested in being a part of this research I encourage you to visit www.walk.org.au/recruit or contact the Project Manager on (07) 4930 6537.